NISA's Tips & Tricks - Touhou Genso Rondo: Bullet Ballet (Part 4) | NIS America, Inc.
Now, keep in mind that this is not an official guide on how to play and win with these two characters. There are multiple strategies for each character, which is completely dependent on your unique playstyle as a player. Bio: Utsuho is a pet raven who holds the divine power of Yatagarasu and is able to manipulate the ultimate energy, nuclear fusion. Being a raven, she has a bit of a bird brain, but don’t let that fool you. Her ability to manipulate such immense energy makes her a feared opponent amongst her challengers. Giant fireballs shoots from the gadget on her right arm, starting out big and gradually decreasing in size until finally disappearing after reaching about 50% of the screen. The advantage is the giant amount of close-to-mid range space it covers. I don’t recommend using this as a far-range attack, as the fireball will disappear before reaching your enemy. Utsuho shoots a powerful, massive, slow-moving fireball across the screen. Like, remember when Frieza destroyed Planet Vegeta in DBZ? Remember that giant fireball? And although the fireball is slow, once it strikes your enemy it will rapidly sizzle their health bar away. The move is also very similar to △. Utsuho deploys multiple fireballs which fly across the entire level and home towards your opponent. This move is much stronger as a far-ranged special move, as the fireballs will not disappear. It's also really neat how they stay in position for a second before shooting towards your opponent. Utsuho shoots about 10-15 small energy balls. Although not too powerful, the move really makes up for the lack of range from her main attack, plus it covers a very wide range of the playing field. Each row of energy balls fly at different speeds, making this a difficult move to dodge. You’ll shoot a large amount of small to medium sized energy balls that bloom in a beautiful circular motion. The hitbox of the energy balls seem relatively small, so it may be difficult to strike your opponent with this move. Utsuho shoots several rows of small, rapid energy balls, effectively creating a wall of energy that your opponent must respect. This move is quite useful as it covers so much linear space, although it doesn’t have any homing abilities. “Get the hell off of me” is what I imagine Utsuho screams when unleashing this move. Six enormous fireballs expand from her body, covering virtually the entire playing field. A skilled opponent might be able to dodge the fireballs, but it's not a simple task. A ring of small fireballs expand from Utsuho, pretty much guaranteeing damage to your opponent. It’s not the strongest of moves, but it’s definitely one of the best in terms of covering space. This move is one of her weaker moves. It shoots a bunch of smaller fireballs to your left and right, but not directly in front of you. Dealing damage to your enemy with this move might prove difficult to novice players. I’m very optimistic about Utsuho’s playstyle. The amount of damage you deal from mid-range is absolutely ridiculous! She’s definitely one of my favorites and perhaps, should I say, top-tier? (although we won’t find out until everybody gets their hands on the game). Like I explained earlier, many of her moves are slow but deal explosive amounts of damage. So, as the player, you’ll have to really understand how to control space between yourself and your opponent to use her at an optimal level. 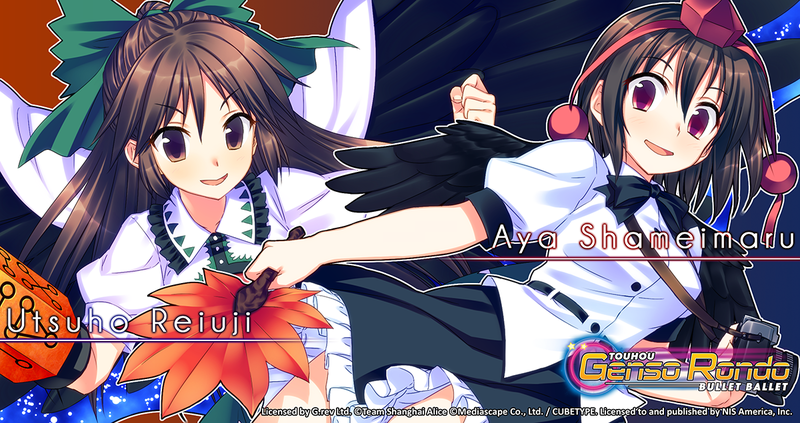 Bio: Aya is a reporter for the town of Gensokyo and has an incredible ability to manipulate wind. She doesn’t enjoy fighting too much, but still wins fights often. As a reporter, she uses wind to collect rumors around the city to help spread slightly exaggerated news articles in the Bunbunmaru Newspaper. Aya shoots two rows of fairly quick bullets. The bullets themselves a very big hit box, making this a very strong “main attack” for Aya. A very large energy blast is emitted from Aya and darts fairly quickly towards the opponent. Holding down ⬜ instead of pushing it once will emit two blasts. It deals a pretty good chunk of damage. Aya shoots a large amount of green bullets. They do have homing properties but not directly to the opponent. Instead, it covers a lot of space around the opponent. One could argue this is useful if you predict the opponent is trying to dash away. Aya shoots two giant blue energy discs that slowly make their way towards the opponent, but disappear after reaching about 60% of the screen. A very useful move to trap your opponents, but only when you are at least half-screen away. Aya uses her camera to snap an energy square that slowly moves towards your opponent and doesn’t deal damage until the very end of the move when it flashes. If you time it so the opponent’s bullets are within the square during the move’s flash, a few bullets of your own will be created and shot in multiple directions. You really aren't supposed to attack your enemy directly with this move. Aya shoots two to six giant green energy discs, which deploy slow, but gain speed after about 2 seconds, homing towards your opponent. The energy discs disappear after reaching about 60% of the screen, so use it only during close to mid range combat. The move is very similar to X. A large amount of circular pink and blue bullets are emitted from Aya and cover pretty much the entire playing field. Virtually impossible to dodge, this is a great move for dealing guaranteed damage. Aya shoots five circular energy discs that expand and contract. These discs are very durable as they don’t disappear when striking the enemy. They’ll keep on expanding and contracting only until the energy runs out. Similar to L1 + X, Aya dashes and uses her camera to snap a large energy square which flashes after about 1.5 seconds. If your opponent’s bullets within the square when it flashes, it will create bullets of your own and spread across the stage. Aya is a strong character with very standard bullet hell patterns and unique “parry” specials. She’s very fast and can maneuver well around the screen - if you time it just right, you can get in close enough for a melee strike. The player needs to have a good understanding of defensive dodging and patience in order to make her work. Over time, you’ll be able to pester the enemy with your bullets and quick speed! There you have it! I hope this was helpful in someway to you guys and girls, and I hope you look forward to next week’s tips and tricks blog. The game is available for preorder on the NISA Online Store, Amazon or GameStop and will be available on September 6 in North America and September 9 in Europe. Until next time, dood!